What’s Your Favorite MMORPG Race and Why? I immediately thought of the Lunar New Year's race through Divinity's Reach in GW2. I did that over and over and really enjoyed it. Did I enjoy it more than the aerial races organized by EQ2's gnomes for every City Festival, though? Or the many races around Metropolis and Gotham in DCUO? And what about that all-time classic, EverQuest's Naked Gnome Race from Ak'Anon to Freeport? Then I read Keen's post and realized he didn't mean that kind of race at all. He meant the kind of race you choose at Character Creation. The one that decides whether you're short or tall, hated or admired, a genius or a dimwit. Whether you're covered in fur or scales, have a tail or wings. All that good stuff. The term "Race", of course, is a bit of a misnomer as it's generally applied in MMORPGs. Sometimes it can be an accurate description, as in Vanguard, which has four "races" with the subtitle "Human", but usually it means Species. Then again, the species boundary gets very blurry in fantasy. We tend to think of Humans, Elves and Orcs as genuinely disparate, separate species but that can hardly be the case when they can interbreed to give us Half-Orcs and Half Elves. Not to mention Half-Giants. The line fades to the point of invisibility when magic comes into the picture with races like EverQuest's Drakkin, "a human race" with "a touch of dragon blood...scaly skin, marking, hair and sometimes horns that mirror the dragon that gifted them their heritage". Exactly how a dragon "gifts" such a heritage is - probably wisely - left to the imagination. The more you ponder on all this, the less sense it seems to make. Why are there so many half elves but no "half-humans"? Is that just a naming convention or are the Elven parent's genes always dominant? If Elves and Humans can interbreed successfully, why not Gnomes and Dwarves? Or can they, but they just don't, for cultural reasons? At first blush MMORPGs - particularly those with a fantasy setting - appear to offer a multiplicity of racial options but they tend to narrow down to a handful once you look at them closely. For a start, almost every Player Race in every MMO is bipedal. Istaria famously lets you play as a (four-legged) dragon, which was the game's primary USP back when it launched as Horizons. Project: Gorgon's Cows are another notable exception, although even there you can't actually roll a cow (!) at character creation. You have to become one by magic in game. 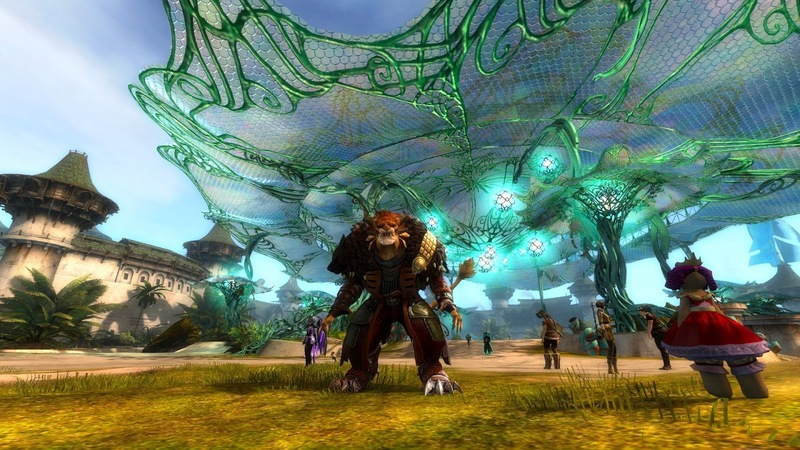 GW2's Charr are highly unusual in that, while bipedal in combat, they drop to all fours when running. It's one of the features that make them so appealing as a racial choice for me even though they are definitely on the larger end of the scale. I do cleave to the smaller races as a rule. 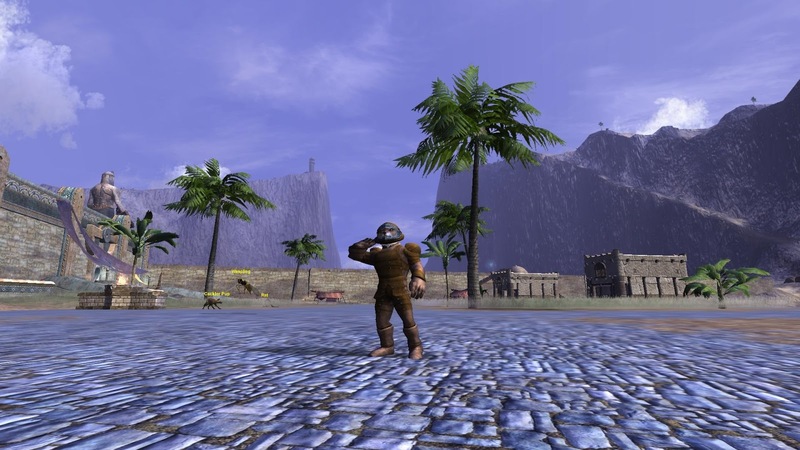 Many Western MMOs have a handful of options that at least attempt to add some variation to the "Short human", "tall human", "human with horns", "human with tail", "human with wings" palette seen in so many imports from the East. WoW has Bulls, Wolves, Goats, Pandas and Undead, all of which walk upright on two legs and look like humans dressed up for Mardi Gras. Allods, which modelled a deal of its visual appearance on WoW, took things a stage further with Gibberlings, who come in packs of three and are a lot closer to "animals dressed up as humans" than the other way round. Indeed, Gibberlings probably rest at the cusp of Fantasy and Anime, or Fantasy and Cartoon if you want to be Western about it, which is where the real non-human races come into their own. 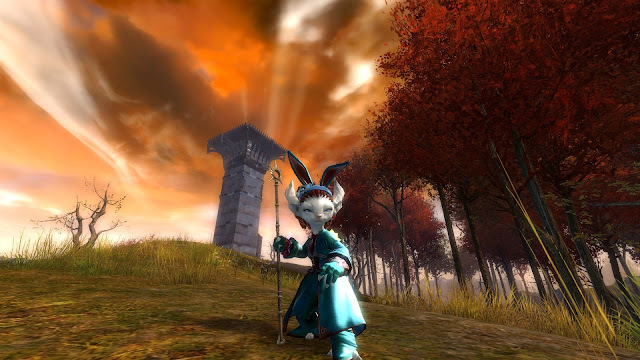 There was that one MMO where I played as a rabbit. What was that one called? Eden Eternal, that's it! It's still running, too. There was also the similarly-named and much-missed Earth Eternal, an all-animal MMO I played in beta with some degree of enjoyment. Those animals still stood upright, though, unlike the deer in Endless Forest, a bizarre affair which has, astonishingly, spawned some kind of sub-genre that incudes Meadow and Wolfquest. Plenty of choice if you cast your MMO net far enough. Closer to home, in the handful of MMOs we all talk about as though they represented the genre, not so much. Which brings me back to Keen's original question. So, what is my favorite MORPG race? Just for once I can answer that question! In fact, I can list my top ten in order without having to think too hard about it. 1. Raki - Vanguard - Stocky foxes with a great backstory, characterful animations and the happiest faces. 2. Ratonga - EQ2 - Cute rats with another excellent backstory and the most endearing verbal tic in gaming. 3. Gnome - EverQuest - Short, smart, every one kinda likes them and they have the tickingest city in Norrath. 4. Charr - GW2 - Big cats that don't do the "catgirl/catman" thing, run on all fours and have the city Ak'Anon would be if it was a military-industrial complex. 5. 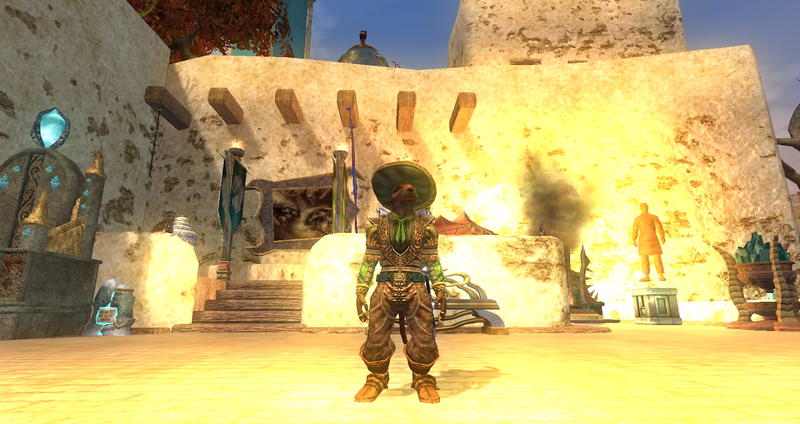 Asura - GW2 - They're rats but they won't admit it. Why do you think they're so obsessed with the Skritt (who would totally be on this list if you could play them). Best animations and great voicework, too. 6. Gibberlings - Allods - Three demented gerbils for the price of one. What's not to love? 7. Vah'Shir - EverQuest - Another non-cute cat race. 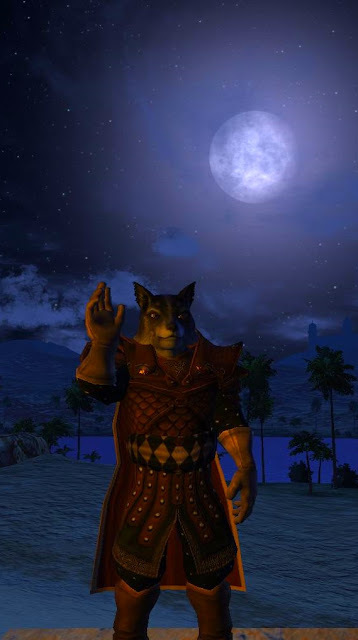 I never really took to the EQ2 version but I played a Vah'Shir Beastlord in EQ for many years and the combination of a tiger-person with a tiger pet is hard to top. 8. Goblin - Warhammer Online - Cowardly, obsequious, disgusting and only they can be the second-best class in any MMO, the Squig-Herder. 9. Dwarf - EverQuest - Just a classic. So solid, so reliable, so predictably gruff. Everything you want a dwarf to be and everything you don't. 10. Riven - City of Steam - The race I wish I'd played more before the game closed down. Cool, stylish, mysterious, the Riven could have been so much more if only City of Steam had followed its original plan. Well, that's the top ten today. Ask me tomorrow and it may have changed. Raki is always going to be number one, though. In my heart, anyway. I have a Worgen character but I can't remember her running on all fours. I only got her to level 20 though - maybe she doesn't have the skill yet. All that confusion around half-breeds you mention is why I decided none of the races in Soulcleaver can interbreed. Fantasy genetics gets way too weird when you open that can of worms. More on topic, it's no secret my favourite race will always be Blood Elves. WoW has great options in general, which is part of the reason I have so many alts. I was also big on the Asmodae in Aion, I love my Bosmer in ESO, and while I don't have many kind words to say about WildStar, I do think their robot race (whose name escapes me just now) is pretty cool. More broadly, I care more about the culture and backstory of a race than its appearance. This is why I tend to favour Elves, even though they tend to be relatively ordinary in terms of appearance. They almost always have rich, fascinating cultures. This is also why I decided to use my 110 boost in WoW on a Nightborne instead of a Void Elf. Void Elves look much cooler, but they're a nothing burger in terms of lore. I don't despise Elves the way Syp does but I do find them a bit dull. I am not a big Tolkein fan and I always found the elven parts of Lord of the Rings among the most ponderous and unconvincing sections of that inconsistent work. Dwarves and even Hobbits seemed far more convincing. Elves are generally drawn a bit too vague and hand-wavy to offer anything like a convincing culture, I find. Lore is important to me too, otherwise it's just a shallow cosmetic option, that as you discussed in your post is often not that deep a difference from the bipedal human norm. I'd have to include Wildstar's Chua in my list as well, similar to Asura I suppose but more physical and animalistic (shades of Tasmanian devil perhaps?). Oh, I forgot the Chua. I played a Chua in the shortish time I spent in Wildstar and they're great fun. Wildstar had a good selection of races as I recall. Also I considered both FXIV's Lalafell and Miqo`te, neither of which is particularly original but both of which are very well done examples of their type. On another day I might have put any of those in my top ten.